A wall and some arbors that were allegedly illegally erected by Melek İpek, mother of Akın İpek, a businessman in a self-imposed exile in Britain, were demolished by municipal teams accompanied by an Ottoman march, DHA has reported. 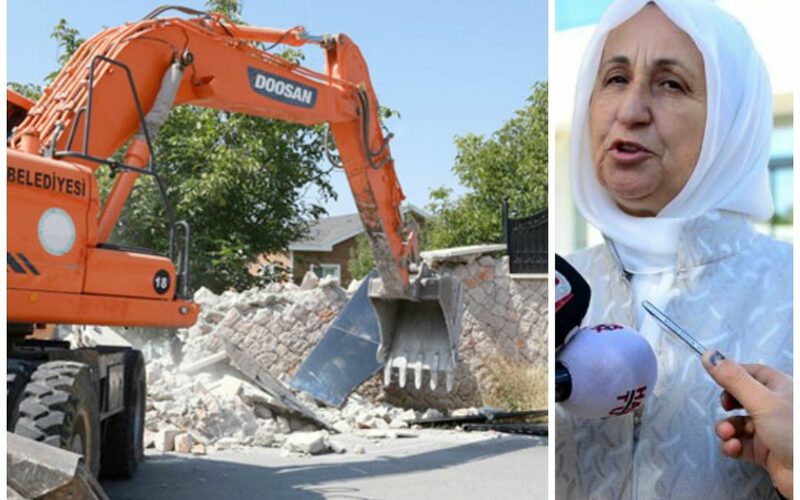 The demolition was carried out by a team from the Gölbaşı Municipality in the İncek district of Ankara following a court decision that rejected an appeal by the İpek family to issue an injunction against a Gölbaşı Municipality decision to demolish the structures. The İpek family has been under immense pressure from President Recep Tayyip Erdoğan and the Justice and Development Party (AKP) government due to their alleged links to the Gülen movement following corruption operations that were conducted on Dec. 17/25, 2013. On Oct. 24, 2015, the government appointed trustees to take over the management of dozens of companies belonging to the İpek family in addition to several media outlets operating under the İpek Media Group, due to their critical stance against the government. Cafer Tekin İpek, brother of Koza İpek Holding Chairman Akın İpek, was arrested in Ankara on April 25 as part of an operation targeting the faith-based Gülen movement. An arrest warrant in absentia was also issued for Akın İpek in 2015. On April 30 Turkish police seized boxes full of legal briefs belonging to Cafer Tekin İpek bound for the European Court of Human Rights (ECtHR). As part of pressure on the family, on June 1 the passport of Nevin İpek, Akın İpek’s wife, was cancelled by the Turkish Embassy in London after it was allegedly reported lost by someone other than herself. Increasing pressure on the family following a failed coup attempt in Turkey on July 15, an Ankara court ruled on Sept. 2 for the seizure of all assets of 65 people including Akın İpek. İpek’s assets are valued at an estimated $7 billion. The Boydak family has been another target of Erdoğan and the government since the Dec. 17/25 corruption operations. The Savings Deposit Insurance Fund (TMSF) on Sept. 5 seized all property and assets of Boydak Holding, a leading business group in the central province of Kayseri, over links to US-based Turkish Islamic scholar Fethullah Gülen. Similarly, a Turkish court on Wednesday ordered the seizure of the assets of 41 businessmen suspected of financing the Gülen movement. As part of an investigation into Akfa Holding and its 44 subsidiaries, the assets of 41 suspects including Akfa Holding executive board chairman Fatih Aktaş, former CEO of İhlas Holding Cahit Paksoy and Fi Yapı executive board chairman Fikret İnan have been seized. Erdoğan and the government have accused the Gülen movement of being behind the Dec. 17/25, 2013 corruption operations and the July 15, 2016 coup attempt. Gülen and the movement deny both allegations. The massive wealth grab attracted international attention and prompted criticism but failed to stop the government, which is continuing with the confiscation of the property of critics. Some TL 12 billion (about $4 billion) in property has been transferred to the Treasury as part of an investigation into the Gülen movement, said Minister for Environment and Urbanization Mehmet Özhaseki on Sept. 1. A pro-Erdoğan imam declared all the properties of Gülen sympathizers to be “the spoils of war” and “halal” during a public post-coup attempt meeting in front of Erdoğan’s house in İstanbul. This article originally appeared in Turkish Minute on September 7.